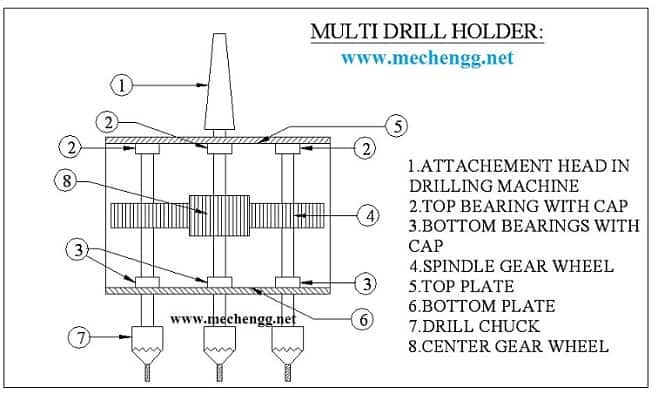 The MULTI SPINDLE DRILL HEAD (Eccentric Drive) is one which can be used to drill a number of holes at various large and even unsymmetrical layouts according to our requirements, where the conventional Multi spindle Drill Heads cannot be used. This is an improvement over geared drill heads and drill heads adopted with universal joints. This is an improvement over geared drill heads and drill heads adopted with universal joints. The drill head is mounted on the drilling machine table. The drill head spindle is inserted in to the machine spindle. It is used to drill a number of holes in different layouts according deals with a proper idea of usage of eccentrics in the field of drilling. The report furnishes a cost estimation of all the components of the equipment by careful considerations of all factors such as cost of material, labour, machining and purchased components. The very essence of our economic life and growth is dependent in a great part upon the continued improvement of Electronic and Mechanical fields. To aid these fields, we have designed MULTI SPINDLE DRILL HEAD [Eccentric Drive] which can be widely used to drill products like printed Circuit Boards, Engine heads and other Automobile components. Extreme care should be there to drill multi holes at different layouts. The MULTI SPINDLE DRILL HEAD [Eccentric Drive] helps to achieve accurate and identical drilled layouts in mass production. We have designed this MULTI SPINDLE DRILL HEAD [Eccentric Drive] model to drill five holes of various diameters in an un-symmetrical layout. In case of drilling large layouts in mass production, we can apply this type of drill head. A Multi spindle drilling machine will drill a number of parallel holes simultaneously in a work piece. Multi spindle drilling machines are employed for work of a light character, especially repetition work, such as drilling small components for the Automobile and Aircraft industries. A Multi spindle drilling machine has a number of drill spindles driven by a single motor. All the spindles holding the drills are fed in to the work piece at the same time. For this purpose, either the drill heads can be lowered onto the work piece or the work table is raised. The Main eccentric is driven by the drilling machine spindle which is driven by a single motor. The several drill holding eccentrics are driven by the main Eccentric through a Revolving plate. Eccentric is a mechanism which is usually used to convert rotary motion into sliding motion. It shall be noted that an Eccentric cannot convert reciprocating motion into rotary motion. Here we are converting the rotary motion into revolutionary motion and in to rotary motion. (ie) when the main spindle rotates, the rotary motion of the spindle is converted into revolutionary motion of the Revolving plate. Through the Main Eccentric and the revolutionary motion of the Revolving plate is converted into rotary motion of the Drill holding Eccentrics. The conversion of the motion is achieved by the ECCENTRICITY provided in the eccentrics. [ECCENTRICITY is 15mm at all the eccentric spindles]. Drill bits can be fed by lowering the Drill head. The pillars provided with springs guide the Driller head in motion. Springs secure the Drill head with drill bits, from a rapid fall, while releasing the Drill head from the machine spindle. It is designed to drill five holes of various diameters in unsymmetrical layouts. The art of ECCENTRICITY plays a major role in this principle. • Production works such as Drilling, Boring, Reaming and Tapping. a. Can be used for very centre distances. b. Presetting for definite depth is possible prior to mounting on machine. c. Outputs shall be obtained at high precision. d. Outputs shall be obtained at high precision. e. High Productivity can be achieved. This drill head shall be applied in Mass production process and mostly suited for drilling printed Circuit Boards, pipe Flanges, Pump housings.